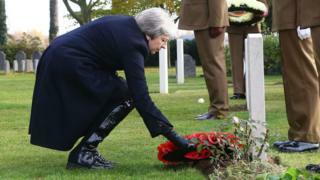 Theresa May has laid a wreath at the graves of the first and last UK soldiers killed in World War One, as part of a trip to France and Belgium to mark the Armistice centenary. Visiting the St Symphorien Military Cemetery in Mons, the PM thanked fallen soldiers for being “staunch to the end against odds uncounted”. She also stood for the sound of The Last Post before a minute’s silence. Mrs May is visiting war cemeteries with the leaders of France and Belgium. Later she will attend a private meeting and working lunch with French President Emmanuel Macron. During the ceremony at Mons on Friday morning, accompanied by Belgian Prime Minister Charles Michel, the prime minister laid wreaths at the graves of John Parr, the first UK soldier to be killed in 1914, and the last, George Ellison. On the way to the cemetery in Mons, a policeman on a motorbike was hurt when a vehicle tried to drive between Mrs May and Mr Michel’s convoys – not realising there were two separate convoys. 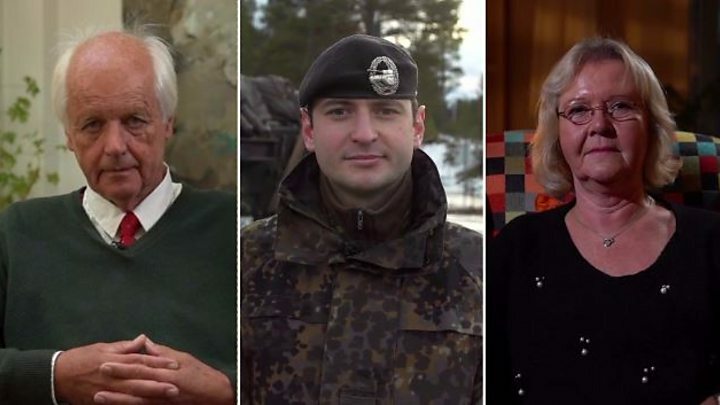 A spokesman for Mr Michel said the policeman and another officer, who was also on a motorbike, “had to manoeuvre so as not to crash into that car” and “narrowly escaped crashing into the Belgian prime minister’s vehicle”. The officer fell off his bike and was “injured but not heavily so”, the spokesman said. Mr Michel got out of his car to make sure the policeman was OK and waited for an ambulance to arrive. The prime minister has travelled to France and will meet Mr Macron in Albert, a town in the heart of the Somme region of France which suffered heavy bombardment during World War One. The two leaders will attend a wreath-laying ceremony at the nearby Thiepval Memorial, which commemorates more than 70,000 British and Commonwealth soldiers. She said the ceremony at Mons was “a fitting and poignant symbol” for “every member of the armed forces who gave their lives to protect what we hold so dear”.